Holly hasn’t had it easy. Losing both her parents very close together, finding herself pregnant at 18 and abandoned by her baby’s father. Holly’s life is her home, her 5 year old daughter, and her Grandfather who lives in the neighbouring house. At 23, Holly has had more than her fair share of heartache, but lives for her young daughter Katy and enjoys a very close relationship with her Grandfather, Henry. Katy’s real father, Billy, suddenly turns up. Full of remorse about never seeing his child, he is now keen to forge a relationship with Katy, and takes an instant dislike to Jack, which everyone puts down to jealousy as Katy clearly adores him. Holly’s best friend Anna is not too keen either, and finds her friendship with Holly in jeopardy, which again is put down to jealousy, as Holly feels that Anna is envious that she has managed to snag herself a gorgeous husband who loves her to pieces. The truth is, Holly knows very little about the enigmatic Englishman who has swept her off her feet. He is very reluctant to speak of his past and seems quite content living his life with only Holly and Katy, stressing how the future is what is important, not the past. After what I thought was quite a slow start to this book, it does pick up pace and it kept me intrigued enough to keep reading it. So much so that I finished this book in a day! It is written in a style that is easy to read, and you don’t find yourself having to think about anything or make sense of what is written, as it just plods along nicely, ensuring you keep turning the pages as the suspense builds slowly. I felt at the start of the book when Holly meets Jack on the bus that it was not going to hold my interest. Holly appears quite dull at first and I felt the storyline was not very interesting. That is the only fault I can find with this book. However, this changes as I found myself slowly becoming drawn into the book, and also the author cleverly drops subtle little hints early on that shows a side to Jack’s character that is not so nice. Even when they first meet on the bus, a subtle clue was there, and I believe that was the very thing that kept me interested. Holly seems oblivious to all of this, but on the other hand you can see why someone like Jack would have a massive effect on Holly, given the life she leads. Her days consist of caring for her daughter and visiting her beloved Grandfather for coffee each day. I did find myself growing to like Holly as the book progressed, even though initially I found her naivety a little irritating as she agrees to marry a man she has only just met. Also she is keen to go along with whatever Jack wants or feels is best for them. Happy to trust his judgement and lead the life he wants. She is blinded by love after finding something she never dreamt possible, and doesn’t want to let it go. The character of Henry, Holly’s often foul-mouthed but totally lovable grandfather, was very well developed. He fast became my favourite character in the book. All he wants is his grandaughter’s happiness. He is initially overjoyed for Holly and is also instrumental at bringing Jack and Holly closer together after they first meet. He finds himself in turmoil when his suspicions of Jack are aroused, and tries to dismiss his fears at first, worrying that after caring for Holly and Katy for so long, he is just being over protective. When Billy goes to Henry for help, he is dismissed from the start. And after all who can blame Henry? Billy deserted Holly when he found out she was pregnant. Although initially disliking Billy and questioning his intentions, his character did begin to grow on me as it seems he has matured and is genuinely sorry for his mistakes, wanting a second chance to get to know and make a relationship with his daughter. I personally did not like the character of Jack right from the start. I feel the author played on her idea of a ‘handsome Englishman’ too much and he came across as a bit pompous. Being English myself, I was irritated by his character which I thought unrealistic, but the author moved away from this and things improved as the manipulative and sinister side to Jack became more apparent. The author does not allow for the reader to like Jack very much, always dropping little hints to make you question him and also to keep up the suspense. There is a part in the book where Jack’s character speaks in the first person and it is very chilling. Holly’s daughter Katy, at 5 years old is a bright child and is enjoying having a father figure in her life. Katy is very close to Henry and his faithful old dog ‘Bones’. Most of the book is written in the third person, but there are a couple of moments where this changes to the first person as Katy confides in ‘Bones’. The writing here was excellent as Katy confides in her canine friend, all her dreams and fears. Overall, this is a very good psychological thriller, and whilst I did think it was going to be predictable, it wasn’t. As the truth began to emerge, I found that I was correct with some of my thoughts, but not all. I did guess correctly where the story would end up, but did not foresee the exact ending nor a couple of things which happened in the build up to the climax. I do like a story with a twist or two and was not disappointed. After a slow start, this became a very intriguing book, which is why I could not put it down and finished it in a day. I recall reading ‘Sleeping With The Enemy’ many years ago before it became a film, and read that in a day also. The character of Jack reminded me so much of the character Martin in that book. Manipulative and very chilling. 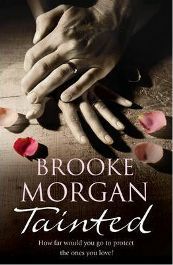 ‘Tainted‘ is Brooke Morgan’s first novel. I am looking forward to her next one, and would recommend this to anyone who enjoys a psychological thriller.